There was a boost for the area with the promise of 800 new jobs at Simonstone Business Park, formerly the Philip's Components Factory and before that Mullard's. The site had been bought by Ribblesdale Industrial Estates and were able to rent out units from 500 sq. ft. upwards. Philip's were still to have a presence with 100 staff retained and based there. Whilst on the subject of new jobs, one Burnley young woman took one on but only on a very part time basis. She had been struggling to pay her poll tax and had agreed to pay the £160 owing at a rate of £2 per week. That was fine until she received a demand to pay the full amount immediately. She was summonsed on two occasions and ignored both but when the third arrived she knew she had to take drastic action because she did not want a criminal record. So she got dolled up and went down to Blackburn to earn the money one night. She admitted: "Blackburn's red light district is not a nice place to hang about in the middle of the night. There are some really dodgy people knocking about and anything could have happened to me. "It's not something I want to do again. I think it's an absolute disgrace I was forced to do that but I got the money in one night to pay off the poll tax." Not bad is it? Run up a bill and then get some bloke in Blackburn to pay it for you. There was some bad news for MP Peter Pike. He'd toppled off a ladder whilst taking down the Christmas decorations at his home in Ormerod Road. He was fortunate not to be badly cut by broken glass but was rushed to Burnley General Hospital. He'd broken several bones in his right shoulder and he confirmed that he'd been told that it would affect him for the rest of his life. The work had started on the pedestrianisation in the town centre which brought with it a temporary traffic system. What chaos it caused. By the end of the first day there had been three accidents at the junction of Manchester Road, Hargreaves Street and Grimshaw Street. Thankfully it was first day problems and things were much improved on the second day. Then there were only two accidents. Each time it led to further chaos and people were just giving up trying to find their way round the new system. I like my occasional bar of chocolate although am careful not to have one too often, but it's not the first thing I look for when I'm feeling hungry. Unfortunately that's what one 21-year-old did. He nipped into Woolworths and nicked a total of £1.77 worth of chocolate bars. His excuse was that had no money and he was hungry but surely he'd have been better nicking a couple of pies from Oddie's or a sandwich from Marks and Sparks. He made matters worse too when he failed to surrender to custody. He was eventually fined £25 with a further £25 costs. Now that's expensive chocolate. In sport, Lowerhouse Cricket Club were mourning the passing of Mr Levy Tranter just nine short of his century. Padiham man Mr Tranter and his family had been committed to and involved with the club for years where he'd been scorer. The whole family had given Lowerhouse great support. He'd had a good innings to get to 91 but it is always sad when someone who has given a sports club so much passes away. So, Burnley went off to the Fylde Coast on a run of seven consecutive away wins in the league, top of the league and becoming favourites to finally get out of the Fourth Division at the seventh time of asking. This is Burnley though, and so often when everything appears to be going right it all comes crashing down. That's exactly what happened at Bloomfield Road as we fell to a crushing 5-2 defeat on Jimmy Mullen's return to the club he'd managed before joining Burnley. Ahead of the game, Mullen said: "There will be one hell of an atmosphere for the game, our fans will make sure of that. It's not that long ago that this clash would have been in the First Division. 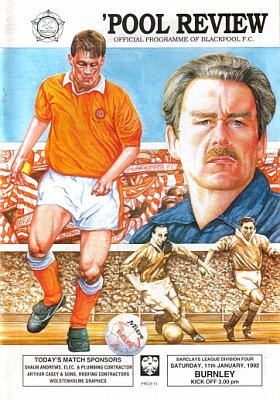 Having said that, both teams have got to get out of the Fourth Division and myself and Blackpool manager Billy Ayre will be winding our teams up for a great game. "The last three times we have played Blackpool we have won but that doesn't mean that we can take anything for granted. All I have told my players is that they must respect Blackpool, not fear them. "We have got to continue to do what we have been doing in recent weeks. Continuing the success is important because when you've got a taste of success like that, you don't want to lose it." Adrian Randall was available again having been cup tied for the Derby game the previous week. Having played so well in that tie, Mullen stuck with the same team with Randall returning via the bench. Burnley fans were there in their numbers, but they witnessed a 5-2 defeat, the first time we'd conceded so many goals since a 5-0 loss at Peterborough in November 1987. It was a bitter pill to swallow because it should never have been such a heavy defeat. A lot of the blame was laid at the feet, and hands, of goalkeeper Mark Kendall but it has to be said that the defence as a whole should have done a lot more than they did to protect him. Both teams had early opportunities with Kendall saving well to deny Paul Groves but on 16 minutes the home side took the lead. David Eyres, a name that would become very familiar to Burnley fans during the 1990s, went on a run down the left. 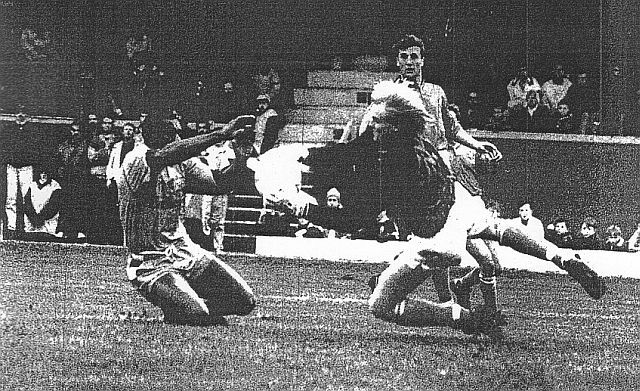 His cross was headed on by Andy Garner for Dave Bamber who saw his shot blocked by Kendall only for Tony RODWELL to scored from close range from the rebound. At the other end, loan goalkeeper Jason Kearton was keeping out everything we could offer but even he should have had no chance on the half hour when Mike Conroy set up Andy Farrell only for the midfielder to blast the ball into the disused part of the Kop. We paid the price and seven minutes before half time fell 2-0 down and this one was all down to the Burnley goalkeeper. Dylan KERR crossed from the left. Suddenly, Kendall realised it was going in, could only flap at it and palm it into the net. We went in at half time with that two goal deficit but gave it a real go in the second half. We dominated the first twenty minutes as Blackpool struggled to get the ball out of defence. Randall came on for Steve Harper and then, with 27 minutes remaining, we got back in the game. It was brilliant work from Roger Eli to keep the ball in play down the left and Mike CONROY converted the cross comfortably. At this stage we looked in with a terrific chance of getting something but three minutes after the goal we were two behind again. We failed to clear a free kick and GARNER blasted a shot across goal and in at the far post. To our credit we kept going forward and on 70 minutes we got our second. John Deary fired in a shot and when it was blocked John FRANCIS swept in to set up what should have been a big last twenty minutes. Sadly, again it only took Blackpool three minutes to respond. A Steve Davis back pass was much too short for Kendall, allowing GARNER to steal in and score. Even then, Eli and Deary combined brilliantly with the latter seeing his shot blocked. Conroy then hit an effort just over the bar, but the next goal ended it as Garner chased 70 yards down the flank before crossing for RODWELL to get his second and Blackpool's fifth. Kendall was horribly at fault as the Burnley fans targeted him. A 5-2 defeat, but the performance was much better than the scoreline suggested and with a better goalkeeper and some tightening of the defence we'd have given Blackpool a very tough game. Unfortunately the result saw us drop to second in the table with news of Mansfield Town's 3-0 win over desperate Aldershot. Blackpoolo: Jason Kearton, Dave Burgess, Paul Stoneman, Paul Groves, Dylan Kerr, Ian Gore, Tony Rodwell, Andy Gouck, Dave Bamber, Andy Garner, David Eyres. Subs not used: Trevor Sinclair, Mark Taylor. Burnley: Mark Kendall, Ian Measham, Joe Jakub, Steve Davis, John Pender, Andy Farrell, Steve Harper (Adrian Randall 57), John Deary, John Francis, Mike Conroy, Roger Eli. Sub not used: Graham Lancashire. That really had closed the gap at the top of the league. Mansfield were now a point clear of us from the same number of games with Blackpool third although two points less from two more games. Then came Barnet and Rotherham who were both four points behind the Clarets having played a game more. 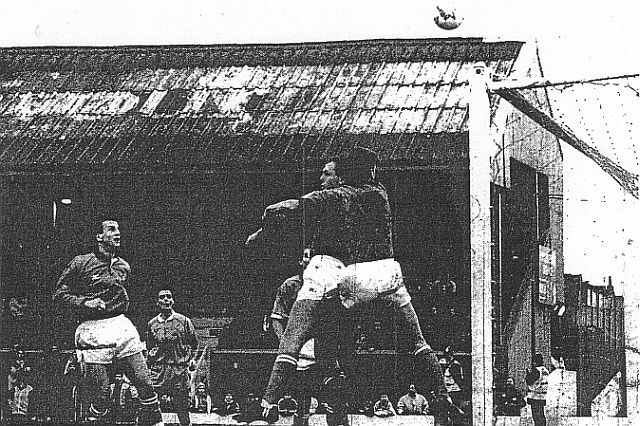 We'd Gillingham next, at home, but before that an important FA Cup replay at the Baseball Ground against Derby County.